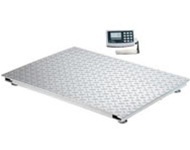 Platform scales are probably the most common measurement devices found throughout industry. Every company that ships parts and materials will use a scale so that they can determine the weight of the package, and therefore the cost of transportation. Goods that are received by the company may be weighed on the scale to confirm that the proper amount has been received. Any time that a container is being fill is appropriate for using a platform scale. The weight of the container could be tared, and the net weight of the contents carefully measured. Where drums of material are being dispensed into a process, a scale would be used to provide an alarm when the drum was almost empty, and could also be used to monitor the usage of the material . Until fairly recently, most industrial platform scales were completely mechanical. Generally, the scale platform would be supported on each corner by a bearing which rested on a set of pivots. The pivots would all be supported by a single understructure device which, in turn, was supported with another lever system. Typically, there would be a 14 to 1 mechanical advantage on the last lever. Finally this would be attached to either a counterbalanced arm or a spring type dial. With a standard capacity of about 1000 lb, and the lever system provided, the counterbalance would experience a maximum force of about 70 lb. While this type of system provided weight information for many years, it was very far from ideal. The pivots and bearings moved against each other, and would experience wear over time. This would cause inaccuracy, and required the scale o be serviced regularly. Because the platform rested on its bearings, there was a certain amount of free motion on the platform. The pivots and bearings, and the supporting lever arms forced the overall height of the scale to be six inches or more. This could make it difficult to place loads onto the scale platform. The scale was also expensive to manufacture, as there were a significant number of parts. There were no practical ways to use the scale to control other devices. Some elementary types of micro switches could be rigged onto the scale, but they were neither accurate nor convenient. Some early types of digital platform scales simply replaced the counterbalance arm with a single load sensor. This type of sensor converts a mechanical force into an electronic signal. The signal is amplified, and then converted from its original analog form into a digital number which is displayed on the electronic indicator. This had the major advantage of being much easier to read than the older mechanical types. It could also interface with other devices, such as printer and computers. But it still suffered the rest of the disadvantages of the older mechanical type. The next step was to place a single large capacity load cell in the center of the scale platform. This directly accepted all of the weight on the platform and eliminated all of the pivots, bearing and levers. The primary disadvantages of this method is that the load cell had to be quite large in order to provide support for loads that could be off center on the platform. Therefore the platform height remains too large for easy use. Also, the size of the scale platform were kept fairly small, with 1000 lb capacity scales at approximately 15 x 20, in order to avoid the off center difficulty. Even with the smaller platform, there is still some movement of the platform when the load is not well centered. A more ideal solution is to provide a load cell under each corner of the scale platform. This method is used by Arlyn Scales to provide the electronic platform scale with the best feature set. The scale platform can now be quite large, ranging in size from 20 x 27 all the way to 48 x 48. But the scale profile can be exceedingly low, at 1 7/8. Furthermore, with no pivots or bearings, the scale will remain quite accurate over time. To provide even better performance, the Arlyn digital scales use stainless steel for the load sensors, which provide excellent resistance to shock loading and overload abuse. A very wide range of electronic features include a USB interface which can send data to a computer, or to a USB memory stick for purposes of logging the data. Ethernet connections are also available, so the scale can be monitored from remote locations. The optional setpoint controller allows the scale to control valves, pumps and solenoids for automatic filling.